My face hurts worse than it looks. My black eye hasn't quite popped, but I have road rash on my face. I'm so thankful that this happened in a grassy area and not on pavement. Anyhow, Tim has wanted stuffed peppers for some time. Because we don't eat a lot of meat, I always forget to buy the stuffing part when we buy the peppers and end up eating the peppers with hummus instead. Fail. This time around, I had some leftover ground turkey and a box of quinoa that I'd been meaning to break into. And we all know I love my crock pot. Place the green peppers in the crock pot. Add the olive oil to a skillet on medium high heat, then cook the garlic, onions and savory seasoning together until soft and aromatic. Brown the turkey and then pour off any excess fat. Add garlic powder, cumin, salt, stock and sauce and allow to bubble for a few minutes. Stir in quinoa, then divide the filling among the four peppers. Add the crock pot lid and cook on low for four hours. When you get back home, mix the cheese and panko, then top each of the peppers with 1/4 of the mixture. Switch the crock pot to high for a half an hour and allow the cheese to melt. 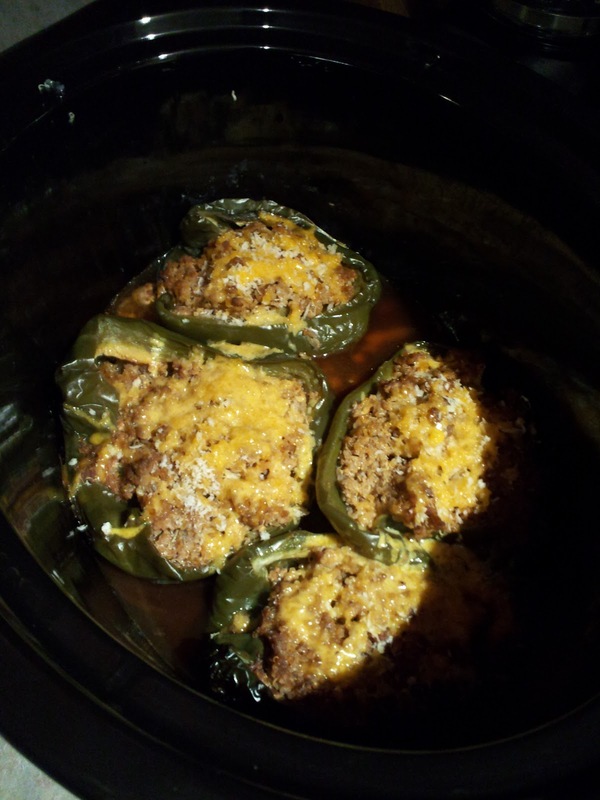 No one in my house loves stuffed peppers except for me. I think this should be a girls' night in recipe for our mutual enjoyment. Sounds so good! Hope your face heals quickly!